Sometimes, the most important work we can do is just to share our stories and have some fun. 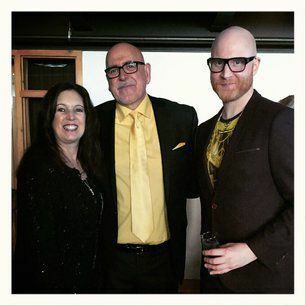 Trillium Family Services' recent Black & Gold Gala was a reminder of just how powerful and transformative this can be! Recently, I had the honor of being named one of Trillium Family Services 2016 Mental Health Heroes alongside such mental health luminaries as Oregon Governor Kate Brown, Corvallis Police Officer Derrick Samuels, Jennifer Pepin of the J. Pepin Art Gallery, Dave Dahl of Dave's Killer Bread, and Gina Nikkel of the Foundation for Excellence in Mental Health Care. 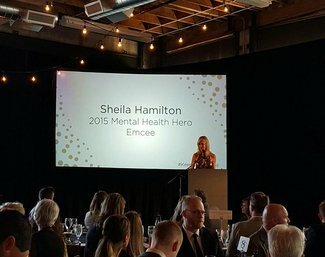 To honor the 31 named heroes and the rest of the mental health community in Oregon, Trillium hosted a "Keep Oregon Well" Gala. A few months ago, I featured some of the people advancing the important work taking place in the mental health field in Oregon, and this list of flawless champions in the Pacific Northwest is still growing by leaps and bounds. The Gala had many of them in attendance, and it was deeply inspiring to talk with them, hear their stories of resilience and dance with them as we celebrated the innovative leadership of this state. 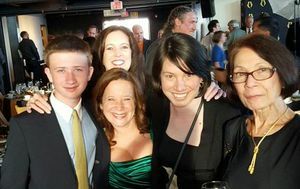 Sheila consistently lights up a room with her important advocacy, and the gala was no exception. Sheila sits on our advisory board at the Flawless Foundation and the board of the Foundation for Excellence in Mental Health Care; her brilliance, natural charisma, and dedication always shine through. Integrated into her role as the Emcee of the Gala, she touched upon the heartbreaking story of her late husband's struggles with bipolar disorder to contextualize how she got engaged in the efforts to change the way mental health is discussed and treated. It was a beautiful demonstration of the way that, even when we are faced with great suffering, our pain can be a priceless gift that can enable us to serve the world in ways we never imagined we could. What an extraordinary young man! An actor, author, and activist, Davis took the gala stage with candor and touching vulnerability to talk about his childhood in foster care and the role that Trillium Family Services played in his life. During his time in the foster care system, he was shuttled between forty different homes, including the Trillium Farm Home. "Because I lived through it myself," he explained, "I understand how detrimental transience is. There's the physical part of it, but there's also the mental instability of it. So, after I got my life in order, I realized that maybe I could make a difference for other kids going through the same things I went through." By the end of his talk, there were few dry eyes to be seen in the crowd -- and his story of turning pain into service was met by a standing ovation by everyone in attendance. Artist and owner of the J Pepin Art Gallery, Jennifer Pepin is a fellow 2016 Mental Health Hero Award recipient! Jennifer is a Portland-based artist who has her own history of mental health challenges, and her gallery features contemporary artists who are reframing the perception of mental health. This work is opening up the the conversation as the artists publicly share their experiences with mental illness. Logan is quite the Renaissance man -- in addition to being Trillium Family Services' Chief Communication Officer, he's also a musician, a writer, and mental health advocate. Logan's ability to share his own personal story of recovery in authentic and moving ways is one of his many gifts. Pat and Beth Walsh are an Oregon couple whose daughter faced significant mental health challenges in her adolescence. Through the support of Trillium Family Services, their family was able to stay informed and empowered throughout their daughter's experiences, helping them to break the silence around mental health and keep them engaged in their family's healing process. In a poignant video, the Walsh family gave a tangible example of the good that Trillium does in the community, and why behavioral health challenges need to be acknowledged as experiences that impact the whole family. It was so special for me to be honored as a Mental Health Hero alongside my compatriot Gina Nikkel. She's long been an inspiration to me, serving for decades in roles including elected official, educator, advocate, and now as the leader of an international organization, the Foundation for Excellence in Mental Health Care. Her work on the global level is profound - In short, she's flawless! The President and CEO of Trillium Family Services, Kim Scott is a powerhouse of activism. He delivered one of my favorite anecdotes of the night when talking about our ability to impact the world by sharing our stories and inspiring recovery. "One of the quotes that most helps me keep on track in my work," Kim explained, "is by cartoonist Ashleigh Brilliant, who said 'strangely enough, this is the past that someone in the future is longing to go back to.' As much as we worry about today's world, we are also in a position to shape it. We shape it by taking personal responsibility for it, and we shape it by coming together collectively to discuss our hopes for it." Kim's comment was such a wonderful summation of the evening -- the Keep Oregon Well Gala certainly was a night in which our community of Mental Health Heroes were recognized for taking personal responsibility for the state of brain health in Oregon, and an occasion for the larger community to come together and discuss our hopes for the future. Congratulations to all of my fellow 2016 Mental Health Heroes, and to Trillium Family Services for bringing us together for a night of flawless fun!